Indian film music—especially from the late 20th century—was a genre like no other in the world. 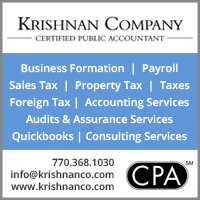 Its legends—from Kishore Kumar and Mohammad Rafi to Lata Mangeshkar and Asha Bhonsle from the north, and S. P. Balasubramanyam and P. Jeyachandran from the south, to name just a few—benefited from influences of classical Indian music, and its unparalleled ability to evoke the Navarasas: the nine essences or feelings of human emotions. Why is the music scene in India unlike any other in the world? It is perhaps the only country where it is the film music that dominates its music industry. Elsewhere in the world some film music may end up topping the charts, as is often the case in the U.S. where Hollywood frequently figures into chartbusters. But the bulk of hits as well as its celebrated artists in most countries come from a music industry that is distinct from the film industry. In India, in contrast, the music industry is largely juxtaposed with the film industry. (Left) The many rasas of Kishore Kumar. 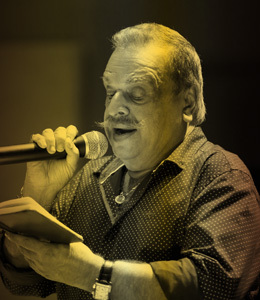 As an actor, he was a natural at evoking a wide array of feelings, but it was as a singer that he could stir hearts and minds delivering songs that were sometimes carefree with abandon and happiness, sometimes pensive, many times romantic, and often sad. 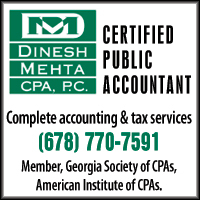 Traditionally, while classical music was appreciated by connoisseurs, folk music appealed to the common man. The 20th century saw the birth of film music, a genre that proved to be a great equalizer. Programs like Binaca Geethmala from Radio Ceylon and Vividh Bharathi from All India Radio brought it into the homes and streets of ordinary Indians. As a result, an entire nation hummed and warbled along with Mohammed Rafi, Lata Mangeshkar, Kishore Kumar, Asha Bhonsle, Manna Dey, Mukesh, Talat Mehmood and Hemant Kumar from the north, and S. P. Balasubramanyam, P. Jeyachandran, Malaysia Vasudevan, K. S. Chitra and P. Leela in the south. And these fabled names barely scratch the surface, considering there have been so many others with entire legions of followers. Songs and music have always played a seminal role in Indian cinema, supporting the screenplay and moving the plot. 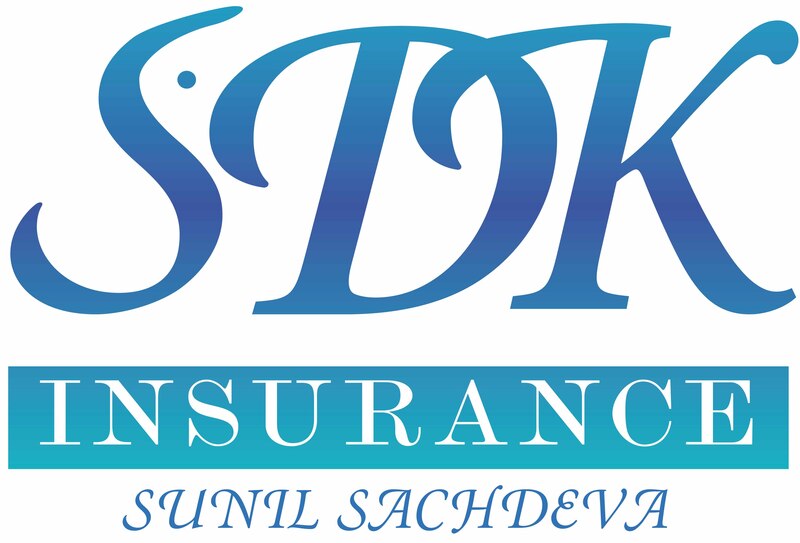 Music directors like S. D. Burman, R. D. Burman, Shankar-Jaikishen, Madan Mohan, Laxmikant-Pyarelal, Rajesh Roshan, G. Devarajan, Baburaj, Johnson, Salil Chaudhary, M. S. Vishwanathan- Ramamurthy, Shankar-Ganesh and Ilayaraja created tunes that transformed popular Indian music with their variations and adaptations. Melody reigned supreme, giving singers ample scope for improvising with their voices to evoke feelings. And then there were the lyricists. Majrooh Sultanpuri, Sahir Ludhianvi, Shakeel Badayuni, and Anand Bakshi in Hindi, Kannadasan, Vaali and Vairamuthu in Tamil, P. Bhaskaran, O. N. V. Kurup and Vayalar Rama Varma in Malayalam, and Udayashankar, Hamsalekha, Kuvempu, Bendre and Jayanth Kaikini in Kannada wrote poetry that was breathtaking in its beauty yet astounding in its simple appeal to common folk. Finally, there were the singers who breathed life into these creations with the requisite emotion and mood, making many of their songs masterpieces for all time. The intonations, the expressions, the meaningful pauses, deliberate nasality, teasing notes, smiles, laughter … these infused such incredible depth into the lyrics, that all the actors on screen had to do was follow the audio clues that the singers gave them. In fact, many actors came to be identified with the singers who sang for them – Raj Kapoor with Mukesh, Shammi with Rafi, Meena Kumari with Lata Mangeshkar, Zeenat Aman with Asha Bhonsle, Kamal Hasan with SPB, and so on. With most singers of those times having been trained in the classical tradition, there wasn’t a rasa that they couldn’t modulate with their amazing voices, rendering even banal lyrics into works of sheer magic. Consider the three components of traditional Indian music: laya, raga and bhava. Laya is the rhythm denoted by tala. Raga is the set of notes that the music follows, and bhava is the emotional component. Filmi music had laya and tala, and sometimes took its melodies from raga, which captured the attention of people. But it was the bhava in the singing that enshrined it in people’s hearts for all time. Let’s consider some potent examples of how Indian film music has deftly evoked some of the ​navarasas, the nine essences or feelings of human emotions that Indian classical music is famous for. Few music lovers would disagree that Mohammad Rafi (right) was the absolute, all-time king when it came to expressions. The nuances that he could convey through his voice cannot be explained in words. They can only be felt. Rafi’s “Tum se accha kaun hai” from the movie of the same name, or for that matter, most of the songs he sang for Shammi Kapoor, are shot through with such mischief and lightness that one cannot help but crack a grin. Rafi does it again for Shammi in “Chakke pe chakka, chakke pe gaadi” (Bramachari) and again in “Badan pe sitare” (Prince). And how about “Hum kale hai to kya hua” (Gumnaam)? Asha Bhonsle: While she was perfectly capable of stirring a range of feelings, she was perhaps her best as the Mistress of mischief and fun. There are many other songs—and singers—that evoke a similar delight: Kishore Kumar’s “Panch rupaiya barah anna” (Chalti Ka Naam Gaadi), or “Ek chatur naar” (Padosan). It is the same with “Namma ooru singari” sung by S.P. 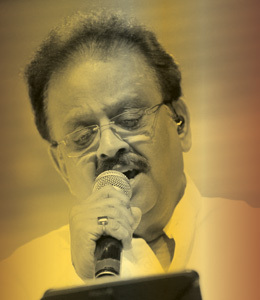 Balasubramaniam in Ninaithaale inikkum and “Ennamma kannu soukyama” by SPB and Malaysia Vasudevan in Mr. Bharath. 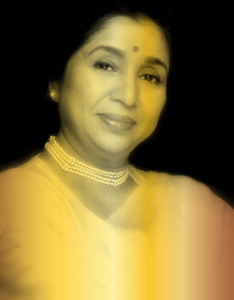 Among women singers, Asha Bhonsle perfected the art of light flirtation as in the memorable “Mera naam chin chin chu” from Howrah Bridge. Lata Mangeshkar (left). What can be said of this nightingale of India? Like her singing career, her ability to take listeners onto a compelling emotional journey was vast! If these singers conveyed the expression of hasyam, then Mahendra Kapoor gave us adbhutam or wonder and amazement at the beauties of nature in his song “Neele gagan ke tale” (Hamraaz), as did Rafi in “Dil kahe ruk ja re ruk ja” (Man ki Aankhen). 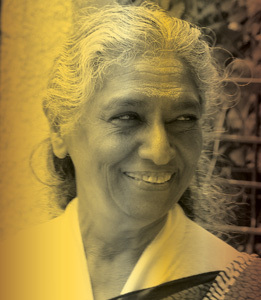 In Tamil, it was S. Janaki singing “Putham puthu kaalai”(Alaigal Oivadillai) and “Oru poongavanam”(Agni Natchathiram). Some songs about travel are so good that they are forever entrenched in our hearts: “Suhana safar aur ye mausam haseen,” sung by Mukesh for Madhumathi, “Gori tera gaon bada pyaara” sung by KJ Yesudas for Chitchor, “Senthazham poovil” sung by KJ Yesudas for Mullum Malarum, and “Kodai kala kaatre” sung by Malaysia Vasudevan for Panneer Pushpangal. S. Janaki (left): The ultimate in emoting, S. Janaki was every director’s dream singer. It is the soulful rendering of each song, helped by strong lyrics, and the sense of pathos as experienced by the singer, that reaches deep within to touch our human core, regardless of caste, religion or race. Contemplative songs like Lata Mangeshkar’s “Kuch dil ne kaha” (Anupama), and S Janaki’s “Mizhiyoram nananjozhukum” (Manjil Virinja Pookkal) touch a chord deep in our psyche. The song “Din dhal jaaye haye” (Guide) is not just contemplative, it also narrates the theme of the movie itself. On the other hand, a deep/ thoughtful song like “Tere bina zindagi se koi shikva to nahi” (Aandhi) is a classic example of the wonders of human relations. K J Yesudas (right): With his mellifluous voice and countless expressions, Yesudas is aptly known as Gana Gandharvan (Celestial Singer). Contrasting these happy or soulful renditions are songs of betrayal and hatred. 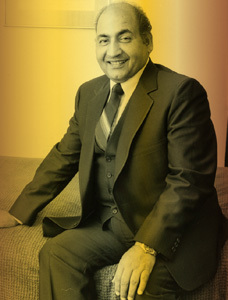 Mukesh’s “Dost dost na raha” (Sangam), and “Koi jab tumhara hriday tod de” (Purab Aur Paschim), Rafi’s “Dil jo na keh saka” (Bheegi Raat), “Patthar ke sanam” (Patthar Ke Sanam), and “Dil ke jharokhe mein” (Brahmachari) and Kishore’s “Meri bheegi bheegi si” (Anaamika) are all about anger, hatred, heartbreak, and vengeance. K. J. Yesudas’s “Oora therinjikittan” (Padikkathavan), T. M. Soundararajan’s “ Neeyumnaanumaa kanna” (Gouravam), and BS Sasirekha’s “Vaazhve mayama” (Gayathri) also send chills down our spine at the anger in them. Meanwhile, Manna Dey’s “Kasme wade pyar wafa” (Upkar) and P Suseela’s “Sonnadu nee daana” (Nenjil oru aalayam) drip accusation, sorrow, and disillusionment. P Suseela (left) : The first of the Telugu trio to dominate the film industry down south, Suseela had to learn to pronounce Tamil words properly before she could sing Tamil songs. But once she did, there was no stopping her. 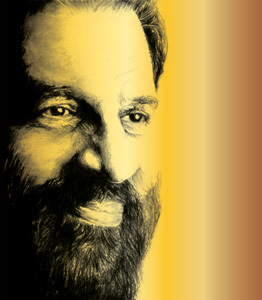 Rafi’s “Man tarpat hari darshan ko aaj” (Baiju Bawra), Manna Dey’s “Tu pyar ka sagar hain” (Seema), Lata’s “Aye maalik tere bande hum” (Do Aankhein Barah Haath), and KJ Yesudas’ “Harivarasanam” (Swami Aiyappan) are prime examples of bhakti rasa. 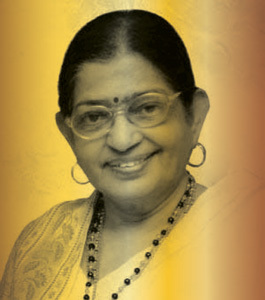 So are “Gangai karai thottam” sung by P. Suseela (Vaanampadi) and “Kannan vanthan ange kannan vanthan,” a duet by TM Soundararajan and Seergazhi Govindarajan (Raamu). SP Balasubramaniam (​right): the man who could make you smile, cry, or laugh with his songs, SPB has ruled the southern movie industry for over 60 years. Long live the king. 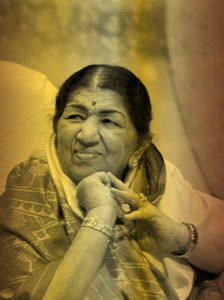 Lata’s “Chanda hai tu, mera suraj hai tu” (Aradhana), Rafi’s “Mein gaoon tum so jao” (Brahmachari), and in Tamil, P Suseela’s “Athaimadi methayadi” (Pathibhakthi), and SPB’s “Kana kaanum kangal mella” (Agni Saatchi) and KS Chithra’s “Thaamara kannan urengenam” (Vatsalyam) are touching, melodious numbers that evoke vatsalya. Given that the romantic angle was a must-have in cinema, when it came to sringara rasa—the flavor of romantic love—every singer of note from those times was so highly skilled that listening continuously to their hit numbers could actually induce a state of intoxication. Praising the loved one, melting with ardor, cajoling, teasing, wanting, begging, reassuring, seducing, … these masters did it all, film after film! It would take a book to enumerate and describe these songs and the singers who painted every shade of love into their lyrics, a task beyond my capacity! Finally there is shokham—sorrow—not a rasa, but an emotion at which these golden-voiced “singer-actors” excelled. Rafi and Lata were legendary in their ability to bring a listener to tears, without the sound of a sob in their voices, if you recall “Teri galiyon mein na rakhenge kadam” (Rafi in Hawas), and “O Basanthi pawan pagal” (Lata in Jis Desh Mein Ganga Behti Hai). And what about “Mohe bhool gaye sanwariya” (Lata in Baiju Bawra) and “Waqt ne kiya kya haseen sitam” (Geeta Dutt in Kaagaz ke phool)! P. Jeyachandran (left): He was the Manna Dey of South Indian music. Regional cinema had its own share of melancholic melodies: “Unnai nenachen paattu padichen” (SPB in Apoorva Sagotharargal), “Naan unnai nenachain” (SPB, Vani Jayaram and Jikki in Kannil theriyum kathaigal), “Kaathirundu kaathirundu” (P Jeyachandran in Vaidehi kaathirundal), “Malarukku tendral pagayanal” (P Suseela and LR Eashwari in Enga Veetu Pillai), “Vaazhve maayam” (KJ Yesudas in Vaazhve Mayam), “Poongaatru tirumbuma” (Malaysia Vasudevan and Chitra in Mudal Mariyadai), “Maanasamaine varu” (Manna Dey in Chemmeen), “Kattadichu kodum” (KJ Yesudas in Thulabaram) … the list is unending. It is the soulful rendering of each song, helped by strong lyrics, and the sense of pathos as experienced by the singer, that reaches deep within to touch our human core, regardless of caste, religion or race. Fortunately, the tradition seems to be continuing with the current crop of singers, despite corruption in the form of electronic music, fusion, and remixes. Contemporaries like A. R. Rahman, Shankar Mahadevan, Sonu Nigam, Shreya Ghoshal, Monali Thakur, Vishal Bhardwaj, Rekha Bhardwaj, and Arijit Singh, and even Atif Aslam from across the border, to name a few, have similar powers of stirring feelings. Sonu Nigam’s “Abhi Mujh main Kahin,” Shreya Ghoshaal’s “Mohe Rang do Lal,” Monali Thakur’s “Yeh Moh moh ke dhaage,” Mohammad Irfan’s “Is dard-e-dil ki sifaarish” (Yaariyan), Atif Islam’s “Jeena jeena” (Badlapur) and “Sollittaale” (Kumki) is a small sampling of such gems. And yet, as far as I am concerned, it is the golden songbirds of Indian cinema—those of the fading generation, that defined and epitomized the lyrical and evocative quality of Indian film songs. Few music lovers would disagree that Mohammad Rafi was the absolute, all-time king when it came to expressions. The nuances that he could convey through his voice cannot be explained in words. They can only be felt. Lakshmi Palecanda, once an expatriate in the U.S., now writes from Mysore, India. Besides being a regular contributor at The Deccan Herald, she is a published novelist.